Thanksgiving is a bountiful holiday–lots of food, family, traffic, turkey, sugar, shopping–you get the idea. It’s also one of my favorites, a time to snuggle in with friends or family, sharing laughter and love, continuing some traditions and creating others. As I settle in this evening in front of a delicious fire with my honey and my two canine “partners in crime,” my heart swells with gratitude for my many blessings. To all those who so generously share your light, laughter, compassion and love with me each day–THANK YOU. Although Bug and Beau’s myriad small kindnesses never fail to warm my heart, today’s post is about the kindness shown to me by two fellow bloggers–folks I’ve not yet had the pleasure of meeting in person who nonetheless enrich my life in ways large and small most every day. The first is David Kanigan, author of the fabulous blog “Lead.Learn.Live.” David is a wonder: funny, insightful, provocative, prolific–his posts give me a reason to pause, ponder, groan, guffaw, or giggle virtually every day. One of David’s posts this morning, “Warm. Soft.Rain,” absolutely made my day. In it, he mentioned one-word associations that sprang to mind for some of his blogger friends, and the one he linked to me was ‘happy.’ A simple pronouncement, yet one that warmed me to my core. I AM happy–incredibly so–and it tickles me pink that my happiness is perceivable, even to those who know me only through my presence online. I’ve been through some rough patches in the last few years, and it wasn’t all that long ago that ‘happy’ would have been far from the first adjective I would have been assigned. But my life has changed dramatically and today I am happy more days than not, and blessed: with a man I adore who loves me dearly (at times in spite of myself); with friends who frequently leave me speechless (and those who know me know this is no mean feat) with the love, patience, and generosity of spirit they show me; with two wonderful dogs who every day make me feel like I’m the greatest thing since sliced bread; with my health; and with the ability to grow in some form or fashion every day. So thank you, David, for that wonderful compliment. The second blogger I would like to thank is Mimi Krumholz of “Waiting for the Karma Truck.” Mimi is a constant source of inspiration for me. She is warm, witty, generous, and genuine. Her humanity shines through in every post. Mimi has encouraged this neophyte blogger in so many ways–she never fails to ‘like’ my posts and comments just as frequently. The knowledge that someone out there is listening, and responding, to my musings is more gratifying than I can say. 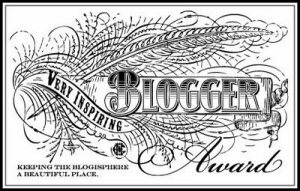 Mimi has also graciously nominated me for not one but TWO blog awards: the ‘Beautiful Blogger’ Award and the ‘Sunshine Blogger’ Award. Though I have not yet fulfilled the mandates associated with receiving these wonderful acknowledgments (but I will, I promise I will!! ), this delay should in NO way be seen as a lack of appreciation. I am, quite simply, touched beyond measure that Mimi would feel compelled to confer these wonderful awards on me when I am so new to the game. This simple act of kindness is deeply appreciated and gave me just the ‘atta girl’ I needed to continue in my quest to grow and develop as a writer. Simple acts, brief interactions, yet so meaningful to me. As Mark Twain said, “Kindness is a language which the deaf can hear, and the blind can read.” I hope that all those reading today can feel how much I appreciate their sharing a little bit of their time with me through this blog. The boost it gives me is beyond measure. You spring from an unbroken line of winners…. This morning’s post from David Kanigan really resonated with me. It was a great way to start my day and it also got me to thinking…..my dogs are pretty darn lucky, too! They live a cushy life and they’re loved beyond belief. How about you? Are you feeling lucky?